Energy Star chest freezers display the blue logo to the right. They are fast gaining popularity among consumers because they offer the best of both worlds – low energy bills and a cleaner environment. 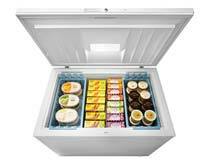 Investing in an energy efficient chest freezer is a great way to keep a tight rein on energy costs. In fact, for a chest freezer model to display the Energy Star certification, it must be independently verified that it consumes at least 10 percent less energy than a similarly sized, non-certified model. To put the importance of this in perspective, DOE estimates that freezers that use energy inefficiently cost American consumers over $940 million extra on their energy bills each year. So if your freezer is more than 10 years old, it’s probably one of the culprits that are insidiously whittling away your hard-earned resources. The increased efficiency of a new Energy Star chest freezer can mean big savings over the lifetime of the appliance. Plus, most Energy Star certified chest freezers are eligible for rebates from your electric company. So, to ensure that the money savings rollercoaster never ends, be sure to check for rebates on the web. Almost everybody is environment conscious nowadays. Buying chest freezers that carry the Energy Star certification is one simple way to do your part to conserve both our fragile environment. Low energy bills. Estimates show that this freezer will require about 326 kWh per year to run. That amount of energy consumption will cost about $35 annually or less than $3.00 each month, which is quite low. An exterior light lets you know the freezer is working so you don’t have to keep opening it to check. A lift out storage basket helps to store your food neatly and to make it easy to see what you have in the freezer. The key automatically pops out of the lock after you lock it so that you don’t leave it in the lock by accident. This is a great tool for child proofing your freezer but also keeping the pilferers at bay. The Frigidaire freezer requires manual defrosting periodically, contributing to its energy efficiency. This model is designed and manufactured in the United States, so if buying American is important to you, this model is an excellent choice. 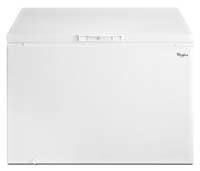 The GE 14.8 cubic foot manual defrost chest freezer (Model # FCM15PUWW) has slightly more capacity than the Frigidaire. Annual energy consumption is a measly 357 kWh. 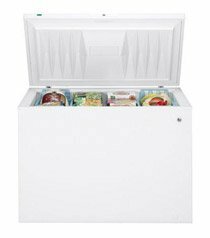 As this translates to an annual energy cost of just $38 per year (or $3.17 each month), this freezer is one of the most energy efficient chest freezers you can own. That it is rated for residential as well as commercial use as well as residential speaks to its sturdiness. Interior lighting means that you can get away with tucking away this chest freezer in sub-optimally lit rooms, should you be short of space in the kitchen. Adjustable temperature controls give you the power to adjust the freezing conditions of your frozen foods from time to time. This is a great feature if you fill your unit with meats, which require a pretty cold setting one month and soft serve ice cream that does best at warmer settings the next. A power indicator light lets you know at a glance that the unit is operating properly and that your food items are freezing well. It includes 4 lift out trays for easy food storage and retrieval. You can, of course, purchase extra baskets if you need them. An internal drain makes defrosting as easy as can be. That freezer operates quietly and won’t disturb your home’s peace and quiet. This is thanks to the foam insulation in the cabinet and lid to ensure quiet operation. The textured steel exterior and color matched handle give this model a stylish look and feel without breaking the bank. Plus, this exterior finish makes it easy to clean as fingerprints won’t show. The Whirlpool 14.8 cubic foot freezer (Model # EH151FXTQ) completes the constellation of bestselling energy efficient chest freezers. Why is it a consumer favorite? This Whirlpool chest freezer only consumes 354 kWh per year. As such, the freezer also has an energy guide rating of $38 per year. This translates to a negligible energy bill of a little over $ 3.00 each month. A lock enables you to secure your food investments put also keep your little ones’ inquisitive hands out of harm’s way. The temperature control allows for 8 different temperature levels so you can toggle until you find the setting that gives you the best results. The freezer coils inside the enclosure on this top performing model wrap around the unit on all sides as well as the bottom. So you get very even temperatures with no warm spots to spoil your food (and the party!). 2 storage baskets make food organization a breeze. It comes with a drain for ease in defrosting. No need for backbreaking lifting or tilting in order to channel the waste water out of your unit. The white exterior is easy to clean and looks good anywhere. Note though that particular model does not have an interior light but you get plenty of ambient light when the door is open so you won’t miss an interior light. In addition, the manufacturers are so confident that this unit will work that they have not included a power indicator light. Ready to Stop Your Energy Costs From Spiraling? It is true that the saving on food more than offsets the investment in an ordinary chest freezer and its annual operating costs. Opting for an Energy Star chest freezer complements these benefits. As such, it is a wise investment for anyone who is keen to keep the energy costs down and also to protect the environment.